I was invited to donate an artwork to the Colored Pencil Society of America Silent Auction at the convention this year. I decided to draw this wolf for the silent auction. I photographed him while I was in Montana a few years ago. What a beautiful animal they are! I plan on doing the wolf on gray Suede Mat board and of course using colored pencils. 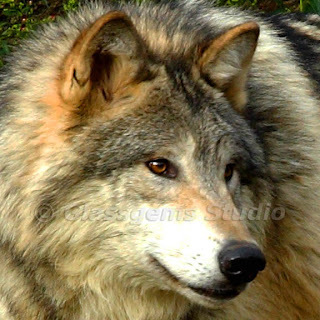 I have several shots of this wolf so I'm sure I will do more artwork from my reference photos in the future. 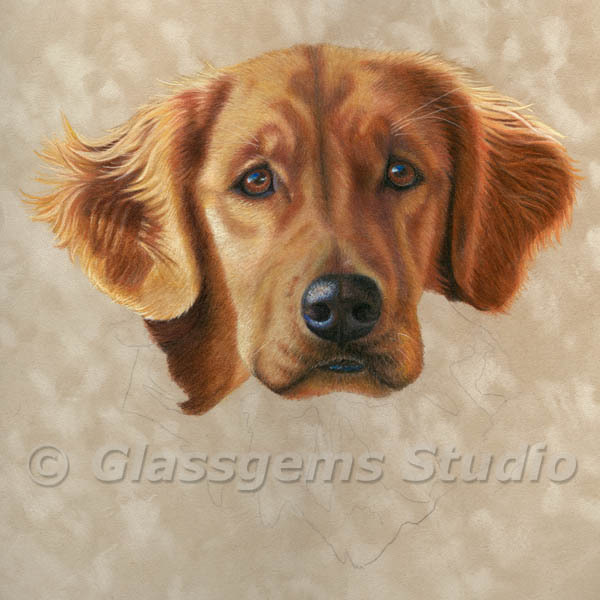 A Golden Retriever Named Reba - WIP Final!! Ok... well here she is.... all signed and approved and ready to deliver. Thanks everyone for your kind comments and thanks for following this Work In Progress. My next drawing will be a wolf, which will also be on suede board and will be my silent auction donation for the Colored Pencil Society of America Convention. I'm going to call this one done.... I haven't sprayed it with a fixative or signed it yet because I want to have my client approve it first. I really enjoyed drawing this sweet little face, Reba is such a sweet dog, so I hope I was able to capture that look. As soon as I get an approval I will sign it, spray it and re-post it here on my blog then. Comments and questions are welcome and thanks for following this Work in Progress. Don't forget to keep Scribbling! Here's another update of Reba. I'm very close to being done. I'm continuing to use Prismacolor and Derwent Colorsoft pencils. What I do when drawing hair is I lay down the medium color first and then add the lighter and darker hairs on top of that. I continually play with the hair going back and forth with the light, medium and dark hairs until I get it looking the the way I want it. One thing with the Suede Board is the earlier layers are always a bit ugly. When working on Suede board, you need to hang in there with the drawing because it does go through ugly stages. I tend to always draw a small patch to completion as I go. It's not necessary to draw that way on the suede board, it's just the way I do it. I work that way no matter what support I'm using. As I have mentioned before, the suede board color is moccasin. If you should decide to try the suede board, be careful not to pick a color darker than moccasin, it would be difficult to cover if it were darker. If you should have any questions at all, let me know. Here's another update on Reba. I haven't gotten a lot done this time but I still thought it would be nice to keep you posted on my progress. I just love the lighting on the reference photo and I'm having fun creating that lighting in the portrait. I'm still using Prismacolor pencils and Derwents Colorsoft pencils. I have to say..... I just love working on this Suede Mat board. If you haven't tried it you should. I thought I would share the latest commission piece I've been working on. 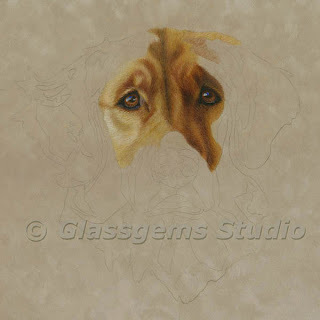 This piece is being done on the Suede Mat board, the color of the suede is moccasin. I will be leaving the background as the suede. I'm using Prismacolor Colored Pencils and Derwent Colorsoft Colored Pencils. I really like using the Colorsoft pencils on the Suede mat board and I also really like the nice colors they have to offer. 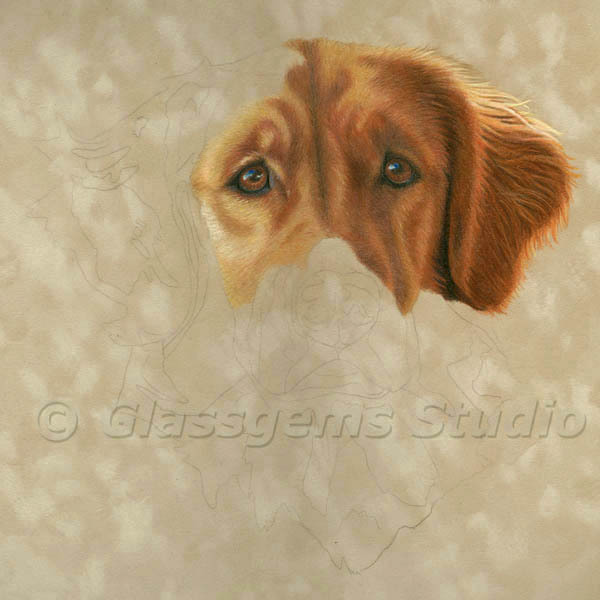 I am still working on the right side of Reba's face as well as the left side of the top of her head. Reba has a lot of red in her coat so I need to be careful to capture that and not be tempted to lean more towards the golden color that most of the goldens are. The reference photo I'm using is the clients photo. I love how my client captured the lighting on this photo. It's very dramatic with a lot of highlights on the right side of Reba's face. It's a nice photo at a high resolution and very clear. The most important thing to remember is the finished piece is only going to be as good as the photo it's being created from. I don't know how many times I have been given a really bad photo and asked if I can fix it. The big problem with that is it's very difficult to draw what you don't see. I will continue to post the updates so be sure to check back and remember..... keep scribbling! 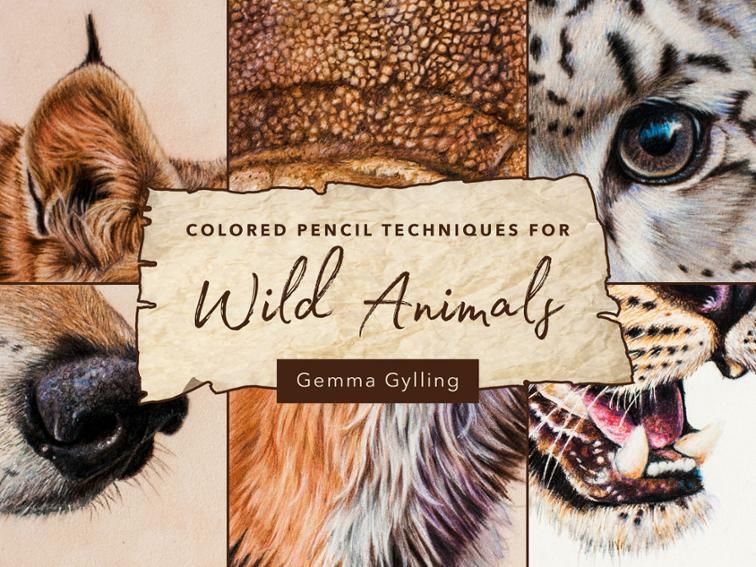 A Brand New Colored Pencil Kit!!! Well... this is the reason you haven't heard from me for a while. 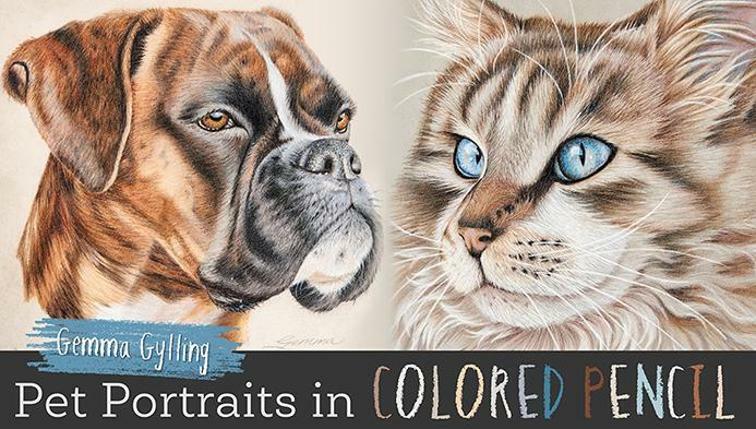 I was working on my brand new "Ann Kullberg Colored Pencil Kit" and it was a secret until Ann announced it on her E-zine. 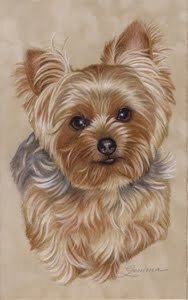 This Kit will give you step by step instructions on how to create this cute little Yorkie on Suede Mat Board. The kit includes the Suede board, the step by step instructions, a reference photo to work from, a contour drawing to trace and seven demo pictures of each stage of the drawing. 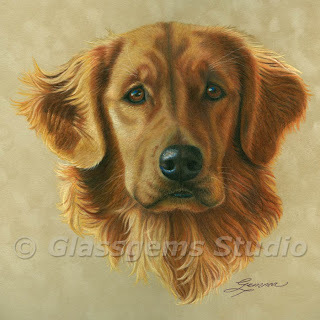 The kit will be released for sale in about two weeks and you can purchase it on Ann's site at http://www.annkullberg.com. As soon as Ann has the kits available I will be posting them on my site for purchase as well. When I do I will post a link of where it can be purchased. This cute little guy is my Mother's dog (my brother.... lol) and his name is Chico. He is just as cute as a little bug. He doesn't realize just how small he is, only 4 pounds! He and my Rotties get along great but, as I said, he forgets just how small he is. I had a lot of fun drawing him so I hope you will enjoy drawing him as much as I did. If any of you should purchase the kit and need help in anyway be sure to send me an email with your questions.